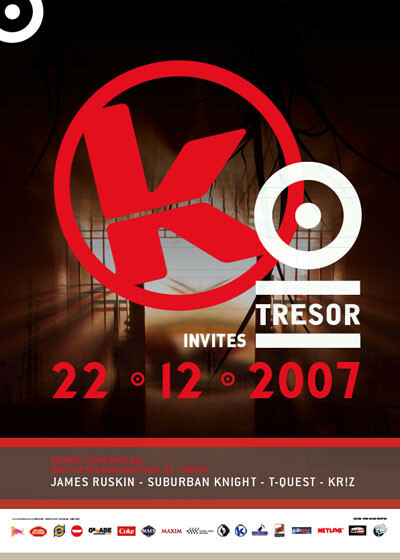 Kozzmozz already going strong since 1995, is honored to invite the legendary Tresor. Tresor, a true techno institution, founded in 1991 by Dimitri Hegemann, was and still is one of the most pioneering clubs and labels in techno-land. The legendary Berlin club had a unique underground atmosphere that was loved by so many clubbers worldwide. The label Tresor developed a strong connection with Detroit, signing people like Jeff Mills or Juan Atkins at the beginning of their careers, and quickly became a breeding ground for more talents from across the globe, Cristian Vogel, Surgeon or Fumiya Tanaka to name but a few. Now that Tresor club has finally found a new home, Kozzmozz brings some of these unique Berlin techno flavors to Gent. Two techno institutions finally meet to rock the dance-floor the Berlin way. First up is James Ruskin who has just released his fourth album ‘The Dash’ on Tresor Records. This is James’ third album on Tresor Records but it is a bit different from the previous ones in the sense that it is not as forceful as ‘Point 2’ and ‘Into Submission’ but builds a bridge between listening music and dance-floor techno. He is joined by another regular guest at Tresor in the form of Suburban Knight or James Pennington. Suburban Knight was at the forefront of Detroit’s early releases on Transmat and Underground Resistance. In this way Suburban Knight and Tresor have a long history as Tresor was one of the first European labels and club to support Detroit artists. Our compatriot T-Quest has been playing for Kozzmozz since the very beginning. He knows how to make the Kozzmozz-crowd go wild like no other ! He’s also one of the few Belgian dj’s to play in Tresor in Berlin not so long ago. Kr!z is one of those few dj’s who possesses the gift to play great records and have an astonishing mixing technique. And there’s more: Kr!z recently presented his own label Token records, which has 4 releases out by Inigo Kennedy, Sub Space (aka Julien and Gonzague), Wax and Radial. All tracks receive raving reviews from the cream of techno dj’s all over the world.